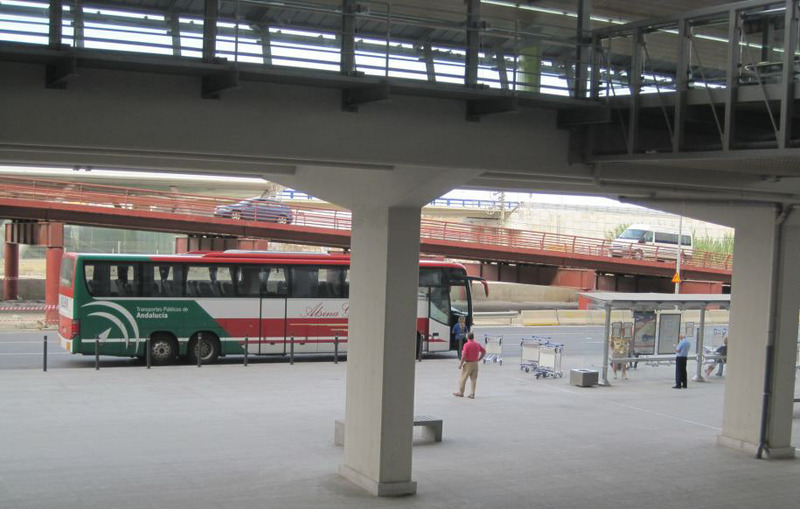 A popular bus service links Malaga Airport with Granada bus station. Travellers to Granada pick up the Alsina Graells bus seen in the picture from the stop where the Malaga Airport to Marbella shuttle bus and the L19 service to Malaga bus station leave from, just outside Arrivals across the big covered meeting area. In the top part of the picture you will see the moving walkway which takes passengers to the Malaga airport train stop. The Malaga Airport to Granada service runs twice a day 7 days a week and may vary with the season. If the timetable above doesn’t suit you, then check through to the Costa del Sol bus timetables page on the Gomarbella online bus booking service and look at the Malaga Bus Station timetable for other buses to Granada. The L19 service every 30minutes will take you from the airport to Malaga Bus Station and from there you can book your onward bus to Granada. Taxi would be the safest best i guess! I will be leaving barcelona the next day and might go to Granada then up to Sierra Nevada mountains to meet up with the family again. Do you know if the snow up in Sierra Nevada will be good on 23rd-26th of december? Hi Steve, thank you for writing in. You might just want to catch the train from Malaga airport to Malaga train station and then walk next door to the bus station. It's a shorter journey by train, 12 minutes, than on the bus. If the bus is right there and you don't have to wait long, you can take the bus of course, the bus ticket office is just outside the Arrivals door and it's a 30 minute journey. There are two buses into Malaga, one goes to the bus station and the other one doesn't! I'll give you a link below if you would like to do an online booking to Granada. You don't need to validate the ticket beforehand and the drivers barely seem to glance at your booking confirmation paper as you get on the bus and certainly I have never been asked to produce my identification. If anyone is sitting in the seat you have booked, wave your paper at them. You'll see from the timetable that there are more than 20 services on a weekday. Certain travel times could be peak times such as Friday afternoons or Sunday evenings or the earlier routes. Getting towards the end of July and beginning of August you are in the main travel times. I'm sure you could get a seat without booking but I would book just for the peace of mind. I did a journey last month on an Alsa bus from Cacares to Seville last month and had free wi fi all the way so keep an eye out for the signs. I have to say it slowed down a lot when we were out in the middle of nowhere! Allow 30 minutes to get your luggage at the airport, then an hour to get to the bus station whether you do it by bus or train, that will give you a comfortable margin. It'll be cool in the Maria Zambrano train station and you can take time out there to have a cold beer and some tapas if you have a few minutes to wait, it's more comfortable than the bus station. Keep a sharp eye on your baggage, wallet and passport at all times getting on and off the buses or trains. We flying to Malaga in three weeks and will be travelling straight to Granada. Unfortunately we will just miss the direct bus, so we will have to catch a bus from the bus station. Would you recommend booking a ticket online or do you think we could just buy a ticket at the bus station. Hi, thank you for writing in. It shouldn't be a problem at all. As you get on the bus in La Linea the driver will open the side panel on the bus, all he has to do is push a button and when you get off, just signal to him to open the panel again. He can see you getting your stuff out perfectly well in his side mirror. Give him a thumbs up and the day will go better for everyone! Will be using thye Portilli bus from La Linea to a stop just outside Estepona and travelling back in the opposite direction.Are drivers amenable to opening the hold at bus stops to put luggage in, or do you have to lug it onto the bus itself? This is a fabulous blog, and as a first-time visitor to the Costa del Sol, I'm hugely grateful to have found it. That said, I've checked through your past posts and haven't seen anyone asking what I'm about to ask, so here goes. I'm staying in Eliviria (at the Alanda Club Marbella), and would like to go to Granada for a day. I've seen bus schedules and train schedules and more bus schedules, and can't quite work out what the best way for me to get to Granada is in a way that will allow me enough time to see the Alhambra and possibly indulge in a hammam visit. Can you suggest an optimal journey? Thank you so much in advance. Your savvy and helpful spirit are making me feel much less daunted by this task. Hi Susy thanks very much for your visit to Gomarbella. If you turn right off the roundabout just after the San Miguel factory on your left after coming off the N340 over the bridge, you can usually find a parking place just in front of or behind the car rental and parking buildings which will do you for a day's visit to Granada. To find the bus schedule from Granada to Malaga and book your seat, use the Gomarbella online bus bookings page. You'll find the complete list of departures from Granada to Malaga for the day of travel that you choose. You can also book online too. Remember to take your winter woollies on your trip to Granada, at this time of the year they have a cold up there that us coast dwellers can never get used to. Best wishes Suzy and thanks again for your visit. Hi Mike… this site is great. Thanks so much. Do you know the departure and arriaval times for the Granada to Malaga service? And….is there any free parking near malaga airport from which we can catch a bus or train? Thanks so much for your help mike! I also forgot to ask, how much (estimated price) will the taxi be from marbella to malaga airport? thanks! I have just phoned the Marbella Taxi company and the girl said that the day fare for a taxi from the centre of Marbella to Malaga airport is €58 and if you travel after 10pm or over the weekend it is €69. I asked her how much it would be if you set off from Marbella at about 6.30am and she said it would be the day tariff. There is a frequent bus service and a metro linking Barcelona airport to the centre of the city. Copy and paste this link: You'll get from Barcelona airport and back very cheaply. I love Barcelona, it has a great feel to it. I think I have been there about 10 times over the last 30 years and it always gives me a buzz. It's well worth a day's visit. If you are on business, save a little space for yourself to see the city. Have fun and please send me a pic if you have time. Hi Bettina, thanks very much for checking into Gomarbella. Unfortunately on the winter bus schedule the first shuttle bus out of Marbella to Malaga airport only leaves at 7:15. This will be too late for your flight. I thought about you catching a taxi to Fuengirola and then to keep costs down, taking the very punctual and reliable train to the airport but the first train out of Fuengirola only leaves at 6:30am and would get you to the aiport by 7:15 which again is too late to do check in and security for your flight. It looks like a taxi ride to the airport Bettina. If you leave Marbella after 6am it will be slightly cheaper than the night rates but check with any taxi driver before you set off. If you are getting back late from your day trip to Barcelona, you might have to budget for a return taxi trip as well. I hope you have a fantastic trip. I'm going to marbella next month and I plan to go to barcelona for a day. 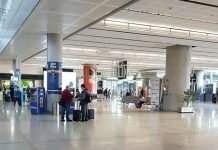 I was wondering how can i travel from marbella to malaga airport? I would prefer the cheapest and safest way (shuttle probably) but my flight is at around 8am. Will there be buses running to malaga airport few hours before 8am? If not, whats the best and affordable way to get to malaga airport? Thanks!